Mabel Loomis Todd is best known for editing and publishing the poems of Emily Dickinson, but she also knew a lot about astronomy. In 1894, the same year she released Emily Dickinson’s letters, she published Total Eclipses of the Sun, a guide to the history, science and appearance of the phenomena. 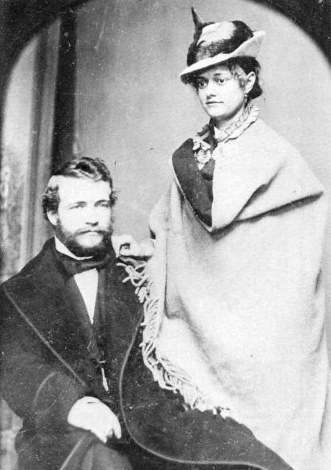 Mabel Loomis Todd came to her astronomical knowledge by way of her husband, David Peck Todd, assistant professor of astronomy at Amherst College. He was a philanderer, while she had a long love affair with Emily Dickinson’s married brother, Austin Dickinson, who lived next door to Emily. Mabel Loomis Todd often helped her husband in his astronomical observations and accompanied him on his eclipse-chasing voyages. She wrote a book, Corona and Coronet, about his expedition to see a total eclipse in Japan on August 19, 1896. She went along on the trip, which included 10,000 miles of sailing aboard the steam yacht Coronet. In the end, clouds obscured the sun during totality. David Todd was so disappointed he wished he was dead. David Todd ultimately regretted choosing a career in astronomy, as he was never able to make the contributions he’d hoped to make. It was his wife who is still remembered as a first-rate science writer – though she is better known as Austin Dickinson’s lover. "That circumstance of a solar eclipse most attractive to the astronomer of the present day is the length of total obscurity. By some celestial mishap this can never be so long as eight minutes. As an average, three minutes will more than cover the length of total phase; and for astronomers and physicists, who are perplexed in their attempts to unravel the labyrinth of mysteries surrounding the Sun which the kindly intervention of the dark Moon discloses, these brief moments are all too short. Unfortunately the best eclipses always occur near the Earth's equator; for while the lunar shadow sweeps easterly across our planet with a velocity somewhat exceeding 2,000 miles in a minute, an observer on the equator is, by the Earth's rotation, also carried eastward, but at a velocity about one half as great. "The nearer he is to either terrestrial pole, the slower he goes, and thus the sooner will the Moon's shadow overtake and pass him by, and the shorter will be his time of viewing the Sun entirely covered."